1. The program's incredible momentum and excitement. 2. The game doesn't conflict with The Masters for the first time in many years. 3. We have a full roster of healthy linemen on both sides of the ball. We can actually have a compelling game. In past years, it has been a real hassle getting ticketed and into the stadium in a timely fashion. I'm expecting this year's G-Day to be a complete zoo in that regard. Luckily, the Athletic Department is making it easy to buy your tickets in advance online. 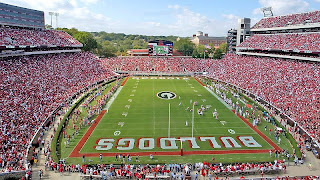 ATHENS, Ga. --- General Admission Tickets for the 2008 G-Day football game are on sale online via georgiadogs.com . This year’s spring football game is scheduled for Saturday, April 5th at Sanford Stadium. All online orders will be mailed out the week of March 24. G-Day tickets are $5 (adults) and $3 (youth) when purchasing in advance of game day. UGA Students who are admitted for free when showing their valid UGA ID card at the gates on the day of the game. In expectation of a large G-Day crowd, the Athletic Association encourages Georgia fans to purchase their spring game tickets in advance via www.georgiadogs.com. Purchasing your tickets in advance will provide quicker access into Sanford Stadium on the day of the game without waiting in line to purchase tickets at the gates. The Bulldogs are coming off an impressive 41-10 win over the previously unbeaten Hawaii Warriors in the Allstate Sugar Bowl and finished the 2007 season 11-2 overall and ranked #2 in the AP and #3 in the Coaches polls, respectively. Oh, $5 order charge, how I do loathe thee. Anybody know what the age limits on tickets are? I have a two year old that, if the weather is nice I'd like to take. Is there a minimum age on tickets. I guess it doesn't really matter, but I don't want to buy her a ticket if I don't have to. I think even infants require a ticket. That's true for the regular season at least. Ticket Schmickets...as long as the Dawgs win. Sounds like the old athletic department wants to draw some interest on the ticket money...hmmm, first step to Felton's buyout? Im pretty sure all the money goes to a local charity. G-Day tickets in advance? Whatever. They may in fact have a larger crowd for those reasons, but it won't be 90,000 strong to necessitate buying tickets early. Besides, it'll be live on CSS. Anon - there are normally around a dozen people taking tickets for 19,000 people. And the lines are ridiculous. If we grow the attendees to 35,000 and even if we double the staff....hell....you won't get into the game before halftime. Any idea if CSS will carry the game ? OK, Paul....so, if people buy their tickets in advance, that means they can bypass the people taking the tickets at the gate? Sounds like that is where the problem is... perhaps the AA needs to recruit more people to accept tickets. People have to buy tickets in advance for the regular season games with a lot more ticket people at the gates, and I don't see that speeding up the wait time to get into the stadium. That's all I'm sayin'. ESPN is carrying the game.